Tom and Tamara Conry stand outside their home in Paradise, Calif., which was almost untouched by November's deadly Camp Fire. Their property insurer notified them in December that it would not renew their policy past January. Tom and Tamara Conry were dead set on returning to Paradise after the deadly Camp Fire destroyed the town last November. The couple's home was barely touched by the fire, and most other survivors had a much steeper climb to recovery. But when their property insurer, American Reliable, notified them in December that it wasn't renewing the couple's homeowner's coverage, they realized that returning home would be even harder than expected. "Getting that letter was like a slap in the face," Tamara Conry said. "Right now, when it's going to be the hardest time ever to get insurance at any kind of reasonable price, that's when you non-renew us?" Other families in Butte County could face a similar insurance dilemma. About 10 percent of buildings in Paradise are still standing after last November's wildfire, according to the California Department of Forestry and Fire Protection. Even though a new California law that took effect in January requires insurers to renew homeowner's coverage on properties that survived wildfires for at least one year, the new law doesn't help people affected by last year's fire disasters like the Conrys. "Their situation can almost be worse, sometimes, than people whose homes are gone," said Amy Bach, executive director of the consumer advocacy group United Policyholders. "They're sort of competing with the total loss victims for attention and dollars, but they also don't have the same protection that a total loss victim has to keep their insurance," she added. Tom and Tamara Conry are now living in a rental apartment in Yuba City, about an hour south of Paradise, because their home is still contaminated by smoke. Their back deck was also scorched. American Reliable covered their hotel after the couple evacuated and is now paying for their temporary rental. But the news that the insurance company wasn't renewing their coverage has just added to the headache of making their home livable again, the Conrys say. At least two other insurers turned them down and they worked with two different brokers to try to find a new policy. "Sometimes I feel like it would have been easier if the house had burned down," Tamara said, adding that she and Tom also feel truly sorry for all the families who lost much more than they did. The Camp Fire of November 2018 destroyed roughly 90 percent of the homes in Paradise, Calif. The owners of the few homes that remain standing may face problems when it is time to renew their home insurance. The California Department of Insurance says it's heard from others in fire areas who have faced a non-renewal from a property insurer. As a state senator in 2018, California Insurance Commissioner Ricardo Lara pushed through the new law that helps ensure at least one year of continued coverage for homeowners with property standing in fire zones. He said this law was intended to help families like the Conrys, who may face the same situation in future disasters. "A sudden non-renewal can shatter survivors' feeling of security that they have barely started to rebuild," Lara wrote. Another new California law ensures people whose homes have completely burned down in a wildfire can renew a homeowners policy for at least two years. Global Indemnity, the parent company of American Reliable Insurance Company, didn't respond to emails and phone calls asking to discuss the Conrys' situation. Mark Sektnan, who represents the industry as president of the Property Casualty Insurers Association of America, says companies are always reassessing their risks. "You want to make sure you don't have too many policies concentrated in a particular area because if there is a loss, it could have negative implications for the company," Sektnan said. One insurer, Merced Property and Casualty, already went belly-up because of the Camp Fire. But Sektnan says there are about 50 homeowner insurers in California, and homeowners like the Conrys are sure to find another option. Policyholders in areas devastated by wildfires will likely pay more for their coverage, though. "That's to ensure that ... people in the high-risk areas should pay a higher amount for insurance than people who live in low-risk areas. Otherwise, people like where I live would end up subsidizing these people," Sektnan said. The Conrys recently found a new homeowners policy, a last resort plan California law provides for people like them. They're paying more than double what they did before. But the devastation in Paradise, and the insurance headaches, have been too much for the Conrys. They've recently decided they're not going back, and have put their house up for sale. Californians who live in an area devastated by wildfires have new protections as of January 1. If their home survives a blaze, their property insurer must maintain their coverage for at least a year after the disaster. But as Pauline Bartolone from Capital Public Radio learned, the new law has come too late to help the families reeling from last year's Camp Fire. 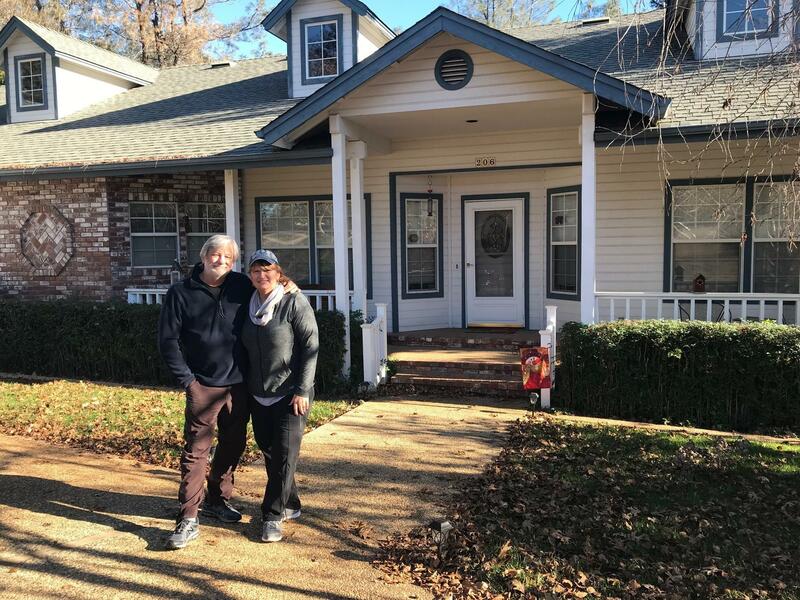 PAULINE BARTOLONE, BYLINE: Tamara and Tom Conry get a rush of emotion when they look at their old neighborhood in Paradise. It's an apocalyptic landscape of burned up rubble mixed in with the few vacant homes that survived. TOM CONRY: So much of it doesn't make any sense. This house is here. This house is not. BARTOLONE: The Conrys' home was barely touched by November's blaze. Fire officials say about 1 in 10 buildings in the town are still standing. And at first, the couple was dead set on returning. BARTOLONE: But as Tamara shows me the inside of their house, she explains they have their own steep climb to normalcy. The home is contaminated by ash and smoke. And their deck was scorched. Their homeowner's insurer covered their temporary housing. But recently, Tamara got some bad news. The company, American Reliable, decided not to renew their policy. TAMARA CONRY: Getting that letter just was like a slap in the face. Right now when it's going to be the hardest time ever to get insurance at any kind of reasonable price, that's when you non-renew us. BARTOLONE: The Conrys say trying to make their home livable again has been stressful enough, and finding new insurance has just added to that headache. TAMARA CONRY: Sometimes, I feel like it would've been easier if the house had burned down. And then you're moving on. BARTOLONE: Tom and Tamara are not the only ones with this problem. The state's Department of Insurance says they've heard from other Californians in fire areas who lost their insurance. AMY BACH: Their situation can almost be worse sometimes than people whose homes are gone. BARTOLONE: Amy Bach with the consumer advocacy group United Policyholders says she knows people in this situation, too. If your house burns down, California law says your policy must be renewed for at least two years. But that doesn't help the Conrys. BACH: They're sort of competing with the total loss victims for attention and dollars. But they also don't have the same protection that a total loss victim has to keep their insurance. BARTOLONE: American Reliable's parent company, Global Indemnity, didn't respond to multiple requests for comment for this story. But Mark Sektnan, the spokesperson for the property insurance industry, says companies have to always reassess the risks. MARK SEKTNAN: They just want to make sure you don't have too many policies concentrated in a particular area because then if there is a loss, it can have negative implications for the company. BARTOLONE: One insurer already went belly up because of the Camp Fire. But Sektnan says there are about 50 insurers in California, so homeowners in fire areas are likely to find another option. They should expect to pay more, though. SEKTNAN: And that's to insure that, you know, people in the high-risk areas should pay a higher amount for insurance than people who live in low-risk areas. Otherwise, people like where I live would end up subsidizing these people. TAMARA CONRY: Watch your step on that. BARTOLONE: The Conrys recently found a new homeowner's policy - a last resort plan California law provides for people like them. They're paying more than double what they did before. 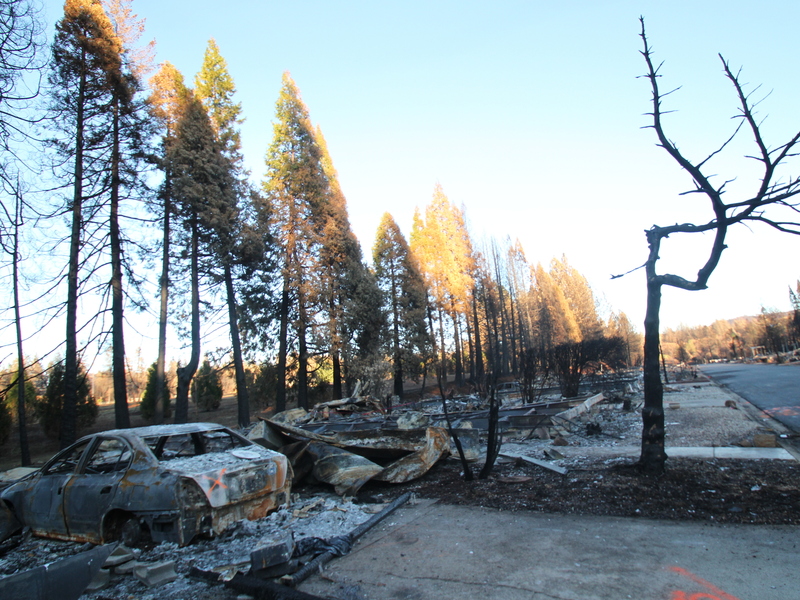 But the devastation in Paradise and the insurance headaches have been too much for the Conrys. They've recently decided they're not going back. And they've put their house up for sale. For NPR News, I'm Pauline Bartolone in Chico, Calif. Transcript provided by NPR, Copyright NPR.